In this article, we’re taking a look at the remittance basis – the alternative tax rules in place for those people who are UK resident with overseas income and gains but are not UK domiciled. This article will be of interest to those studying for any of the CII R03, R06, AF1 or AF5 exams. First let’s make clear what the arising basis of taxation is; this is used for UK residents and means that their worldwide income and gains are taxed in the UK. If that money is also taxed in the other country, it still needs to be declared and taxed in the UK; although, in most cases there will be a double taxation agreement, meaning that relief is given in the UK for the tax paid overseas. (HMRC may require evidence of paid foreign tax). If you are UK resident but not UK domiciled, then you have a choice: to use the arising basis or the remittance basis. What does remittance basis mean? The remittance basis means that UK tax is only paid on overseas income and gains that are remitted (or brought) into the UK. (Tax will be charged in the normal way on investment income from UK sources). If the remittance basis is chosen and the individual is a long term UK resident, then the Remittance Basis Charge (RBC) will apply if the person has more than £2,000 unremitted income/gains and they are over 18. The RBC is basically a tax charge on the overseas income/gains that are left outside of the UK and has to be paid on top of any UK tax paid on UK income/gains, as well as any overseas income/gains that are remitted to the UK. 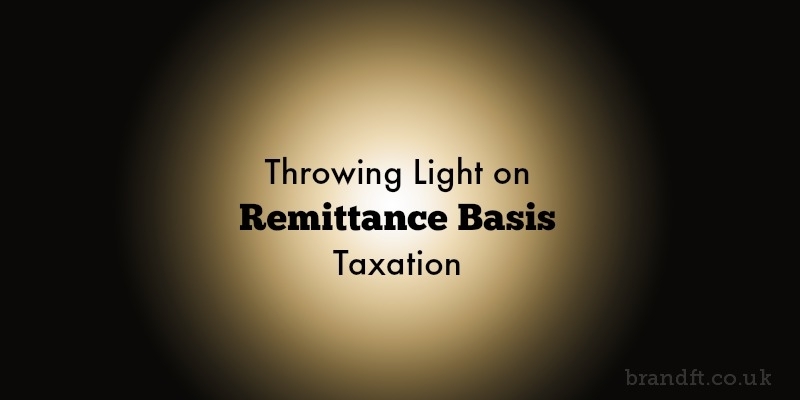 Remittance Basis as alternative taxation for UK residents living and earning income outside the UK. If someone chooses the remittance basis, they would not normally get a personal allowance or the CGT annual exempt amount – the exception being where unremitted income/gains is less than £2,000, in which case the remittance basis automatically applies, and they keep both the personal allowance and the annual CGT exempt amount. They also won’t have to pay the RBC if they are a long-term resident. Remember, if the person has no overseas income/gains, then their domicile status has no impact at all on their UK income tax/CGT position (but could be relevant for IHT purposes). Interestingly (and not something we think will ever be tested! ), a remittance doesn’t just occur with actual income/gains; it will also occur if something is remitted that was derived from overseas income/gains. For example, if someone buys a work of art overseas using their foreign income and then brings that piece of art to the UK, this is a remittance because it derived from foreign income. Another example is where money is received in the UK from another UK resident, which is in return for overseas money transferred to them overseas! If you’re studying for your CII R03 exam, and you’re wanting to feel confident on exam day, grab our free taster to try out one of Brand Financial Training’s resources for yourself. Click the link to download the R03 mock paper taster now! Alternatively, you can try the taster for any of R06, AF1, or AF5 if you’re studying for one of those exams. Did this help you to understand what Remittance Basis means? Let us know in the comments!